Workout Routines and Weight Training Schedules to Build Muscle and Get Lean. 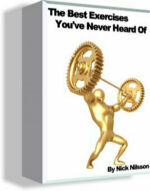 Weight Training Tips, Exercises and Free Program for real results. Is it tough to devise a high quality workout training schedule? For some, the concept remains a mystery but it does not have to be. Often, employing a little logic and common sense in planning a weight training schedule is all that is required in order to get into shape. There will be a need, however, to modify your workout training schedule in accordance with your current situation. If you only have a couple of days to work in the gym you will have a much different training schedule than someone that is able to workout every single night. Regardless of the type of workout schedule you follow, consistency is the key. Haphazard and inconsistent training is most definitely not going to be helpful to those looking to stay in shape. Try to avoid missing workouts whenever possible. This will ensure that your workout training schedule delivers the intended results. To help those out that may be curious as to what type of training schedule to employ, here is a look at how to properly devise a solid training regimen that can fit into your schedule. Yes, you most definitely can make great gains working out in the gym on a two day a week schedule. Some bodybuilders are even able to maintain their mass during the off season with such a workout. The key is to put a lot of effort and intensity into these two days in order to get a big boost out of them. DAY ONE: Supine and incline bench press with a barbell; dumbbell and barbell bicep curls; overhead triceps extension; bent leg dead lifts; and calf raises. DAY TWO: Barbell squats; leg extensions; forward and rear lat pull down; cable rows; ab crunches; and ab leg raises. As you can see, this is a total upper and lower body workout. Reps and poundage will vary based on how much mass you want to try to pack on in a two day a week session. Try to avoid working out on consecutive days as you do want to gain enough rest that proper muscle recuperation will be possible. at least two days between workouts would be optimal. Three Day a Week Weight Training ScheduleThis will not be much different than the two day a week program other than it will add additional exercises to a body part. DAY ONE: Supine and incline bench press with a barbell; incline dumbbell chest press; dumbbell and barbell bicep curls; cable biceps curl; overhead triceps extension; triceps rope pulldowns. A four day a week training schedule brings with it the potential to be very creative in devising and planning the program. The following schedule is designed to promote mass and definition in the same week. For many, this would be the most effective workout schedule to put together. DAY ONE: Supine and incline bench press; chest flyes; and barbell bicep curls; cable biceps curl;ab crunches. DAY TWO: Barbell squats; leg extensions; barbell hack squats; military press; dumbbell shoulder raises; ab crunches. DAY THREE: Decline bench press; decline chest flyes; close grip triceps bench press; ab crunches. DAY FOUR: Forward and reverse lat pull down; cable rows; bent over back dumbbell rows; ab crunches. Most people will work this program with Sunday and Monday being a training session; Tuesday being a day off; Weds and Thurs being work days; and then Saturday off. The key is you do not want to work more than two days in a row to boost your rest period. A five day a week training schedule comes with many complexities. Namely, you run the risk of over training. This is why you need to evenly spread out your mass and definition exercises so that you do not undermine your ability to recuperate properly and develop the mass you need to develop an excellent physique. DAY ONE: Supine bench press; supine chest flyes; barbell biceps curl; triceps overhead extension; ab crunches. DAY TWO: Barbell squats; leg extensions; forward and reverse lat pull downs; ab leg presses. DAY THREE: Incline bench press; incline chest flyes; dumbbell biceps curl; triceps kickbacks; ab crunches. DAY FIVE: Decline bench press; decline chest flyes; cable biceps curls; triceps rope pull down; ab crunches. This is one of the most complicated of workout programs you can devise because workout out daily will require careful attention to mixing hard workout days with lighter ones. If you workout too hard all the time, you will end up burning out or running the risk of an injury. Cardio work will also have to be integrated into the process because you simply cannot lift weights every day. This would lead to atrophy of the muscles. DAY ONE: Upper body mass building for 15 minutes; and 45 minutes of cardio work on a stairmaster. DAY TWO: Upper body definition building exercises for 30 minutes; and 30 minutes of cardio on a treadmill. Again, these are one hour workouts but they are designed to hit one targeted area with the weight training and then intermix cardio into the remaining time in the gym. You need to plan such a workout carefully since you do not want to kill yourself' in any one session. After all, you will be coming back to the gym the next day. You will also need to modify your diet in order to handle the workout. Namely, you would want to up your calorie intake in order to have the energy for such a workout. Natural carbs should be a large part of the diet since you will be needing them for energy. Additionally, you will also need to increase your protein intake since this will be required for muscle repair. Saturated fats, however, should be avoided since they can sap your endurance. Back to Top of Weight Training Schedules.